Those Could Be Anything…An Inflatable Stem Cell Installation Bursting With Pluripotent Potential is a special art project specifically designed to be part of a traveling exhibition. This installation is created not only to be beautiful but also to create a forum for discussion addressing the hotly debated issue of stem cell research. 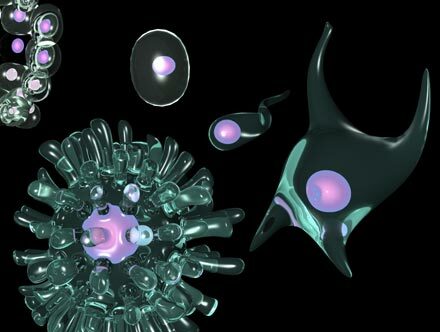 Those Could Be Anything… literally blows up the debate making a series of larger than life inflatable embryonic stem cells. Through scale color positioning and form the visitor to BioAgenda will encounter stem cells, the subjects their debates, face to face at a human scale. Those Could Be Anything… is of course a pun it refers to the fact that out of context the viewer may have no clue as to what he was looking at, as well as the raw potential and finally unspecified cells and their uses in the ever burgeoning field of biotechnology. The inflated forms in the first part of the installation are purposefully made to look cloned, undifferentiated, and clustered a series of unspecialized or “pluripotent” inflated units, poised to become absolutely anything. As the viewers leave the Blastocyst , they will encounter a second set of inflatables. Instead of being contained, and seemingly generic, this set would be free standing or floating and used rather to break up and enhance space in a large dining or garden area. The inflatables would be found around the room singly or in clusters. 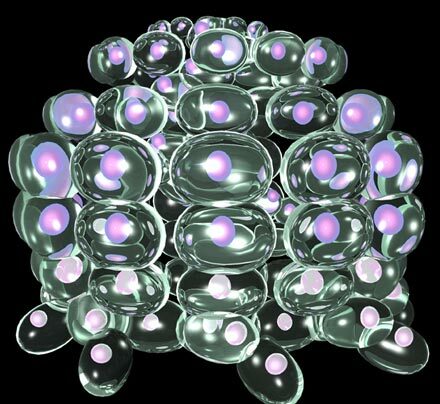 Spontaneously Differentiating Stem Cells: There are thousands of different kinds of cells within each body this set of inflatable would show the stems cells in different degrees of metamorphosis into various kinds of cell shapes. For example, a nerve cell would elongate and grow tendrils whereas a red blood cell would become a concave droplet shape. The cells would be more animate and lively as their differentiated shapes floated as if into a symphony of the variety of positions.